Well there you go! Cheers for that...amateur mac person at the moment (and forever will be unless TNT deliver soon). 1 second to be lost would already be too much. Any workaround to avoid losing footage (and I thought I was now free from workarounds). I feel the same way, that's why I'm sticking with AIC 720/30p for now. I've tried everything to get the HDV codec to work. I unchecked the "create new subclip on start/stop", I set in/out points around the interview clips but it still happens. I wonder why apple hasn't fixed this, since they are clearly trying to make HD100 owners happy by putting out the 24p codec. After updating, when capturing 720p25, I still lose about 5 seconds on the beginning of each new clip. I knew this happened with 720p30 before, but i supposed it's now fixed... how come is this happening in 720p25... my camera has recently been on the repair bench and has probably some of the latest firmware version... it's a GY-HD100E. Scott, you said: "make sure to pre-roll all your clips if you are going to shot 24p" - when shooting events that's not always possible, and even when it is, 1 second to be lost would already be too much. I guess we shouldn't throw away our old workarounds just yet (especially event videographers). 2. Launch MPEG Streamclip (available from this link: http://www.squared5.com/svideo/mpeg-streamclip-mac.html ) and open the .m2t file you wish to convert. 3. Fix the timecode breaks. (press “Apple-F”, then click "Proceed"). This is a good idea if you've captured the last few seconds of the previous shot when using DVHSCap. 4. Select your In ("i") and Out ("o") points. 5. Select “Export to Quicktime” (Apple-E). 6. Scroll through the “Compression” codecs and select an uncompressed codec (such as "Apple FCP Uncompressed 8-bit 4:2:2" or "Apple FCP Uncompressed 10-bit 4:2:2"). 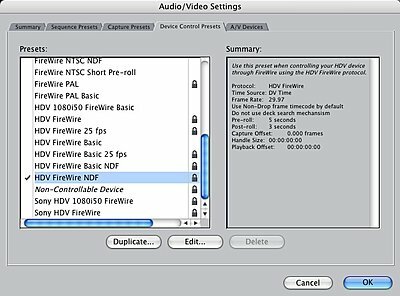 I do NOT recommend selecting "Apple HDV 720p25" as this will introduce an extra step of MPEG-2 compression which will tend to degrade and add artifacts to your image (especially if you are intending to export your final sequence from FCP as HDV 720p25). 7. Drag the “Quality” slider to 100%. 8. Deselect both “Interlaced Scaling” and “Reinterlace Chroma”. 9. Make sure the “Frame Size” is “1280 X 720 (16:9)” or "1280 X 720 (HDTV 720p)". There should also be a message "No scaling will be performed" when you have this right. 10. “Frame Rate” - type in "25"
12. Type in the file name, select the destination and click "Save". 13. 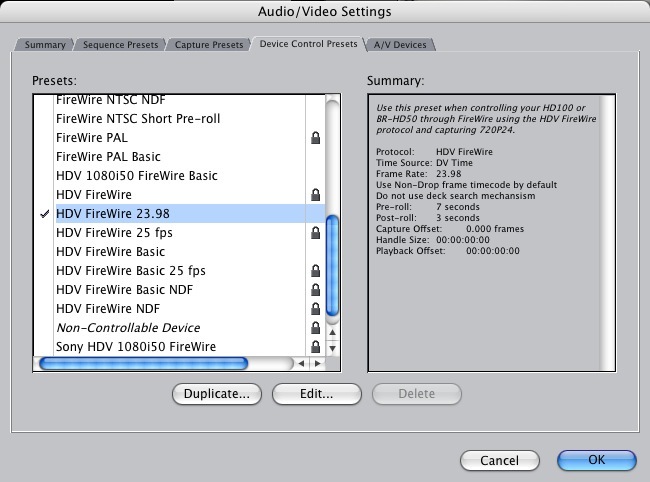 Import your newly created Quicktime movie into FCP and drag it into your HDV 720p25 sequence. I would imagine that it would be rendered and then behave like all of the footage that was captured directly through FCP. And because the clip is less than 10 seconds long, making it uncompressed shouldn't cause any problems with drive space. I have been checking everyday for the update on both my Quad and MacBookPro (not knowing if one would somehow get the update before the other) and today I litterally jumped up in the air and screamed YEEEESSSS! I imediately grabbed my HD100 and switched it to 24p and shot my roommate (he was the only one near). He was a little confused, since he just woke up and was making coffee. I picked the east setup and changed the device options to 23.98 (like Tim said) and batched some clips. It looks and works great. I'm so glad I never got Lumieare or similar. Dang hassle. JVC just released a downloadable firmware upgrade for the BR-HD50 that will improve compatibility with FCP 5.1.2. I haven't performed this update yet, but I assume this will address 23.98 vs 29.97 TC issues during 720P24 capture. After updating, when capturing 720p25, I still lose about 5 seconds on the beginning of each new clip. I knew this happened with 720p30 before, but i supposed it's now fixed. I f you look ihn the FCP capture presets you'll see that there is 5 second pre-roll and a 3 secon post roll buffer. You can try to modify the settings to a smaller value but you will need a bit of time to let the tape get up to speed. Ithought that pre and post roll didn't mean much in capture now mode, but hdv is another story. Last edited by Sergio Barbosa; September 29th, 2006 at 02:51 AM. Does this 5 second missing portion relate to the breaks in the tape when you have stopped recording (moving location say) or even when you have merely paused the tape and continue recording footage? It's a pain because I'm usually hovering my finger over the record button waiting for something to happen, or often a suprise shot is 'offered' to you and you have to quick-fire the record button...you'd miss all this with a 5 sec snip. Not so bad if you can change this to 1 sec pre roll...but are there any paybacks for doing this? Does the missing footage happen only when capturing a long section of tape across the pause/rec breaks or even when setting in and out points for each shot and doing a batch capture after logging? IOW, making sure the logged clips don't contain any pause/rec breaks. The reason I ask is because I thought the pre-roll time was the setting for the deck to rewind say 5 secs before the capture in-point to get the tape up to speed before commencing capture. It wouldn't really have an effect on those pause/rec breaks on the tape. Or am I wrong? 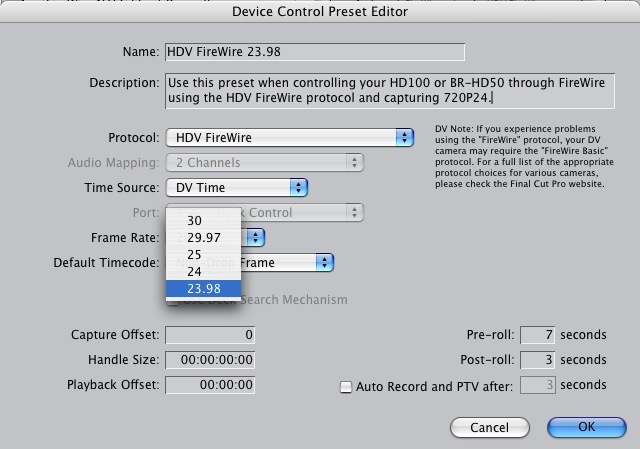 In my Audio/Video Setting I don't see a "HDV FireWire 23.98" in the device preset pull down menu. 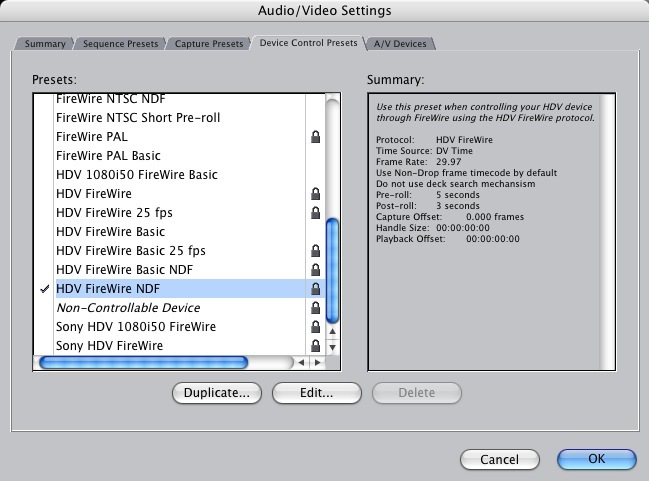 However the "HDV FireWire NDF" seems to work in the easy setup mode. Updated FCPRO and our BR-HD50's today. Once I went into Audio Video settings and corrected the device control preset to read 23.97 TC all is well. I was able to capture 24p just fine. The missing video happens over any pause/rec break on the tape as FCPro seems to think the Mpeg stream needs to be restarted. I didn't try setting preroll to 1 sec to see the effect on these long breaks as it "Searches". But I did try logging in and out points for the shots one by one. Then setting preroll to 7 seconds to allow the BR-HD50 to get up to speed before the capture. I walked away and 4 or 5 shots captured fine without any missing footage. The pain is that the BR-HD50 trasport is so unresponsive, logging clips takes a lot of patience. Especially if you're used to Sony BetaSP or DVCPro machines. ^^ Dave - would that work out ok if I wouldn't be using the BR-HD50 i.e. using the camera as the tape deck? You know, you aren't the first person to mention this. Maybe this preset was already there from when I was doing my own unsuccessful experiments with 24P capture. Anyway, I will edit my advice in the first post and add more specific instructions here. 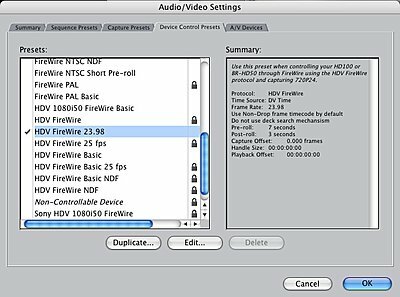 Change the frame rate to 23.98, the preroll to 7 seconds, and edit the name to read "HDV Firewire 23.98"
capture aborted due to problems with stream? Did a serious pproject on HDV 720p25 after a brief test with Lumiere HD. After a really disappointing two weeks of capturing and recapturing using Lumiere DVHScap and Mpeg Streamclip i almost gave up HDV as a serious thing. So you can imagine I was really thrilled by the long expected compatibility from FCP and 720p25 HDV. But now i am getting sad again. After capturing two tapes more or less succdesfully, the third tape capture is aborted due to "timecode break" or "problem with the stream". Timecodebreak is not possible because the whole tape is shot in one take. 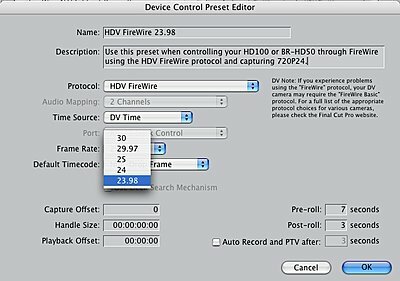 I tried different device control presets (hdv 720p25 and hdv 720p25 basic) different ways of capturing (by logging first and capture now). Different camera output options(native and 720p) but the same problem occurs every time. i'm getting really frustrated now. This seams to be no serious option in professional editing.